The first Aigle Castle was built in 1179 by the Barons of Aigle in the form of a small fortification, that later became the center of the modern castle, along the road over the Col du Pillon and Col des Mosses passes of the Rhone. However, only traces of this first castle have been archaeologically discovered. The castle was rebuilt in the 13th Century, with a fortified donjon and a curtain wall. In the 14th Century, the Lords of Compey added turrets and in 1450 built a massive tower in the south corner. This tower was an example of late French Donjon architecture. 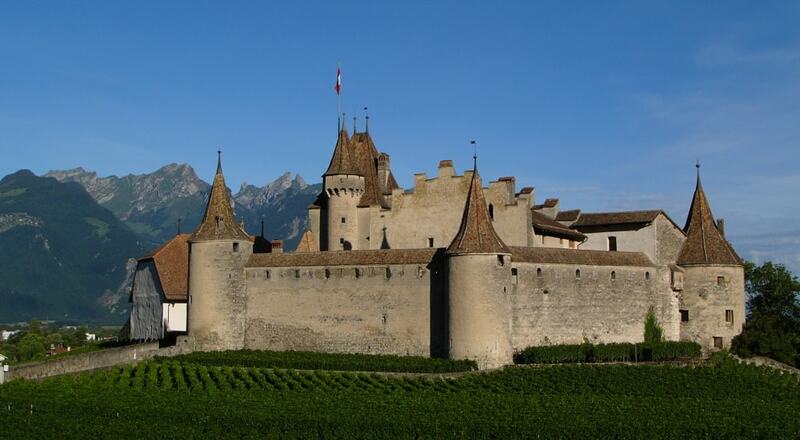 In 1804, the castle was acquired by the community of Aigle and until 1976 it was used as a cantonal jail. Since then, it has been a museum open to the public. Today the castle is home to Wine museum, while next to the castle gates is the Maison de la Dime, which houses the Wine-Labels Museum.